It’s been a while! But it doesn’t mean I haven’t been cooking. This is something that came out of no where. I had pulled pork leftovers, and we got tired of tacos and sandwiches. So I had to find something new. I love lasagna, but I’ve never made it before. I remember a friend had made me an eggplant lasagna, and it was awesome. But this is no pasta and sauce recipe. The pulled pork is going to take a long time to cook. I used leftovers. In a blender, add chopped bell peppers, 1/2 onion, 2 tomatoes, celery, and garlic. Blend until smooth. Sprinkle the pork with the spices along with salt and pepper. In a large pot that can contain the pork shoulder, add the pork, bayleafs, and blended veggies. Add water until it’s level with the pork. Bring to the boil, and reduce to a low simmer. Let this go for 3 hours, checking it once in a while. Once it’s done, discard any excess liquid and pull the pork with forks. It’s really fun to do! 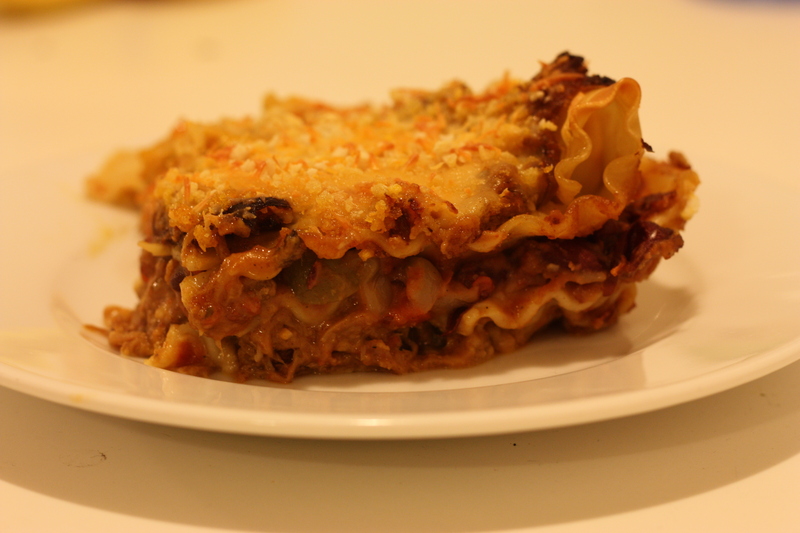 Cook the lasagna as you work with any pasta, al dente. Let the lasagna cool and dry before using. In another pan, add the beans, chopped tomato and onions, and olives. Add about 3 cups of a water, bring to a boil and reduce to a simmer. Check and stir to prevent it from burning. Cook this for about 40 minutes. Once the beans and pork are ready, it’s time to assemble! Pre heat the oven to 400F, don’t forget that. First, I added a thin layer of the beans to a Pyrex dish so that the lasagna wouldn’t stick. Then did the layers as follows: pasta, beans, pasta, pork, pasta, beans. I pressed down the layers to make everything nice and tight. Then I topped the whole thing with some Parmesan, dots of butter, and bread crumbs. I have no idea why I decided to put breadcrumbs on it, but it was a good choice. 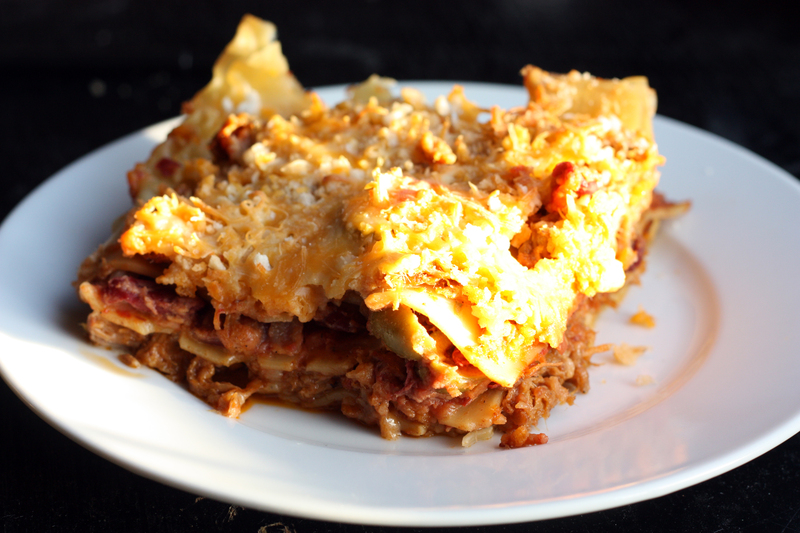 This entry was posted on May 13, 2012 by rrfoods in Dinner, Pasta and tagged beans, lasagna, Puerto Rican, Pulled Pork.